Private Reserve Naples Blue | Inkdependence! Yep, there are going to be some Private Reserve inks this week. I don't buy many bottles, but PR was my go-to ink brand for years and years, so I have a few of them. Naples Blue is a really interesting sort of color. 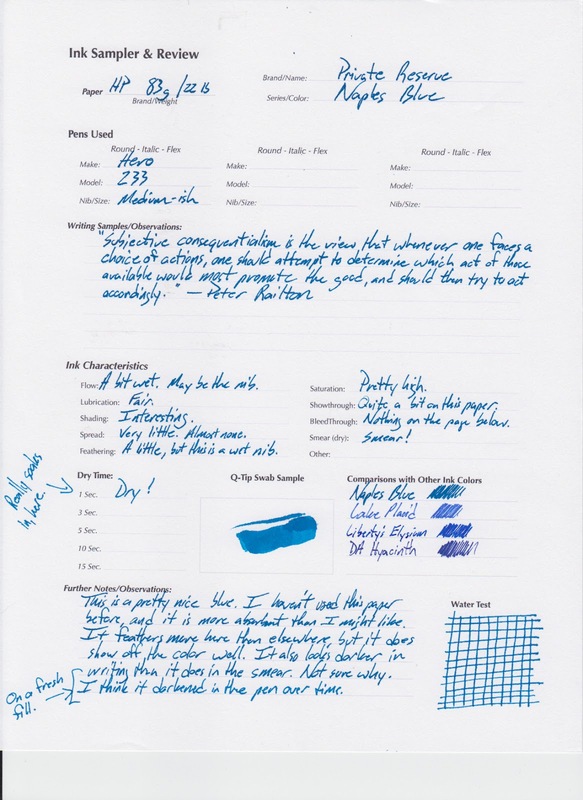 It's a blue that looks near to a turquoise in some lights or from a wet nib. It's nowhere near as green as a Blue Suede, but it's not as blue as Liberty's Elysium (or Lake Placid, which I will post next.). Actually, it looks very blue in the scanned image that I did, so I took a picture with a camera as a comparison. It's probably the difference between natural and LED light that makes the difference. As you can see, there's a pretty big difference between the two. The dangers of reproducing a blue ink online, I suppose. The quote you see there in the writing sample area is just a passage that I randomly opened to in one of the books that was on my desk. This ink soaks into the paper, and it is saturated, but it still manages to have a bit of shading to it. It dries quickly, and it doesn't smear once it's dried, but it can't take water. Don't get this one wet. I have another video for you on this one, actually. I thought it was going to be okay at first, but I was surprised by how terrible it looked once it dried out. If you get this one wet you're going to ruin the text and whatever is beneath it. Don't do that. It's not a deal breaker for me, but it is something to watch out for. Apparently this ink will also change color a little bit as it sits in your pen. I had it in the Hero for a while (a week or two, maybe) before I wrote the review, and it was a bit darker than I thought it should be. Not a lot, but you can see the difference after a fresh filling in the last line of the written review bit. You'll also have noticed, if you clicked the link above, that the smear that Goulet's has online is significantly lighter than the ones that I did. It's closer to the scanned image, so perhaps they do scanning for those swatches rather than photos. Or perhaps my bottle has just aged or they changed the color a little bit. I can't tell for sure. Anywho, this is a blue that is different enough from the rest of my collection to catch my eye, and it's suitable for all sorts of uses. Watch it on cheaper paper, however, as it tends to feather and spread a bit. It is fine on mid-grade stuff like the HP paper that I tested it on above.